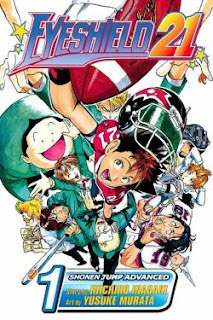 It’s phenomenal that Eyeshield 21 is as fun to read as it is – high school students dealing with peer pressure, getting in on social cliques and adhering to the worried warnings of best friends should be boring as all hell. However, it's hysterically over-the-top and the purposefully ironic drama is a great vehicle for pushing a story that’s less about coming of age and more about a singular sport: FOOTBALL! Let’s be blunt: Eyeshield 21 Vol. 1 is a stupid manga; the football captain is a deranged psychopath who uses rocket launchers, vicious dogs and brutal beatings to train his consistently terrible gridiron squad. Also, the dude has vampire fangs and a lizard-y tongue. But this ridiculous absurdity is the charm of the knowingly-silly story about Sena Kobayakawa, a first-year student at Deimon Highschool who inadvertently lands a spot on the Devil Bats’ football field. The absurdity, however, is as dumb as it is charming. When his best lady-friend Mamori urges him to be more socially involved, Sena offers his services to the school’s football team – a consistently awful team with an embarrassing losing streak. Though he expects to be the ‘gopher’ for the team, he ends up with more duties than deliveries, something bullies force on him because of his notoriously lightning-quick running speed. But when Hiruma, Deimon’s most frighteningly sadistic and deceptive student, catches wind of Sena’s speediness, he immediately begins suckering him in to the sport. Since Kobayakawa is a total pushover (which is sort of annoying throughout since it’s the subject of nearly every joke on his behalf), he buys the false offerings of friendship and winds up as the team manager. Though the actual football-action doesn’t, ahem, kick off until the final chapter, the in-between of recruiting, training and meeting the team is surprisingly engaging since the incredible fast pace of the comic keeps you hooked. While it’s sometimes difficult to tell what’s going on behind the clouds of smoke, speed-lines and cluttered mess of characters, Eyeshield manages to maintain an insane intensity throughout that makes it really addictive – Sena’s slow growth from pushover to player is a big component of that, as his aforementioned lightning-quick hustle results in a ton of things happening immediately after each other. A lot goes on in almost-200 pages of Volume 1 – the last bit of which has perks in the form of info on the sport of football, secondary character bios, a school map, newspaper clips etc. – and every second of it will have you wanting to grab the pigskin and tackle some chumps. Though the story is predictable (and limited) it’s totally entertaining throughout. Watching the Devil Bats play their first game, and then seeing the climactic finale where Sena – whose identity is concealed behind a the number 21 on his jersey and a tinted eye shield – hits the field runnin’ is as intense on paper as it is on ESPN (if not more so) thanks to some completely badass page-wide spreads of the newly nicknamed “Eyeshield 21” emerging from clouds of dust in thick detail. Where Sena’s awkward and stealthily hidden high-school football career goes from here is pretty obvious. Having to keep secrets from his friends will inevitably backfire, and the road the championship can’t be far ahead. But between the games, the actual goings-on of this awkward loser could actually blossom in to something great. And if the stupidity and combination of unrelenting adrenaline and wacky-go-nuts action keeps up in each and every frame like it does here, you’ll be thirstin’ for Eyeshield like Gatorade at halftime.